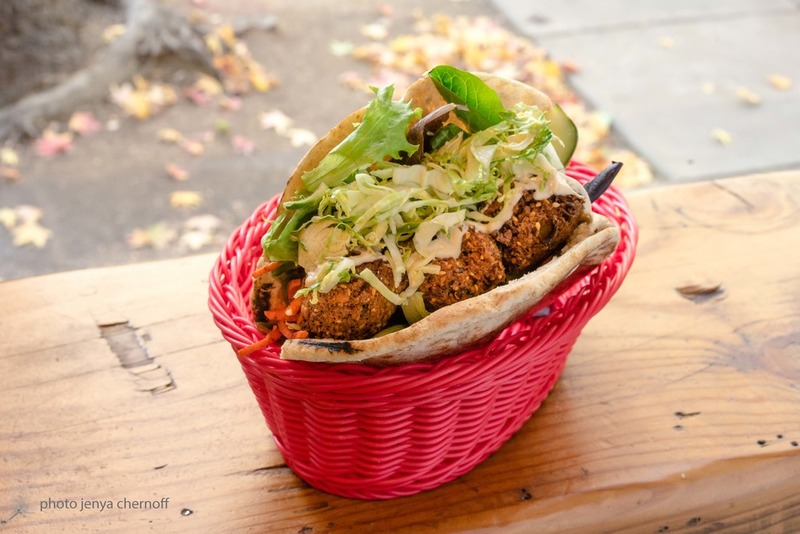 Liba began as a falafel bar, in 2009, roaming the streets in one of the Bay Area's first "new wave" food trucks, then expanding into our first brick & mortar in Uptown Oakland, in 2014. Finding inspiration in the falafel shops of Amsterdam, we wanted to deliver the same ingenuity, accessibility, and flavor intensity to the streets of the Bay Area. It was clear from the beginning that our customers connected with our novel and fantastic flavors; our creative and seasonal approach to unique salads; our ability to excite the palette. You may also notice a bit of a romantic feeling in our shop—that’s because we’re sort of sweet on you. You feel it, right? 'Liba' means romance or love in several languages, and while some people may find a falafel affair a bit of a reach, they’ll see what we’re talking about when they join us as a customer. At Liba, we love salad and we love you. We think you two should meet. Serving real food is important to us. We make our falafel fresh every day, and along with our salads, soups, and desserts we prepare everything at our Oakland restaurant. We navigate our buying choices by searching for local ingredients, allowing us to support California farmers, provide fantastic food, and contribute to your health…all in one fell swoop. All of our take-away packaging is compostable. At the end of the day, our cooking oil gets turned into biofuel. We’ve chosen natural drinks that are low on sugar, high on novelty, and sharp on flavor. Gail Lillian has worked in the food industry for over 25 years, trained as both a chef and pastry chef. She’s been around the chopping block, as a café owner, catering chef, private home chef, and cake decorator. She celebrates food with vigor and thinks it brings a sometimes black-and-white world into beautiful vivid color. Gail is a frequent guest speaker and consultant on the subject of entrepreneurship and finance. She's an avid volunteer in the community, as a Certified Mediator, helping to facilitate communicative dialogue between disputing parties for a few local organizations. She is also trained as a CASA (court-appointed special advocate for foster youth). She collects ceramic goblets and superballs, just because. You know how sometimes there's a rush of babies born 9 months after an economic depression? Well, birthing a green truck was painful, but watching it grow was worth it. Gail started Liba Falafel in August 2009. After graduating an immersive program at Renaissance Entrepreneurship Center in October 2008 (the very week the economy crashed), with a plan to open a bakery/cafe, she decided the time was better for the low-investment food truck that she had planned to open later. And so, Liba was born. Our first restaurant followed in Uptown Oakland in July 2014. We retired the food truck in June 2016 to focus on restaurant growth.